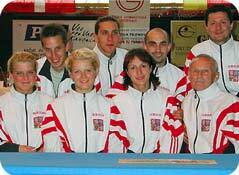 The sport hall of TJ Turnov (Czech Republic) held the international competition on Saturday, 2nd June 2001. Mix 6-members teams from the Czech Republic, Denmark, Great Britain and Rhineland (Germany) participated. This competition is the traditional challenge international competition which Czech trampoline competitors take part since 1994. That year the Czech team replaced the team of Switzerland, one of the prestige founders. 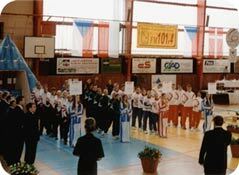 After 5 years Four Nation Competition came in the Czech Republic again - last time Kostelec nad Černými Lesy (Czech Republic) entertained trampolinists from 4 countries in 1996. Four Nation Competition in Turnov was the top events of the Blue Pyramid Club Children Day. The Club of building savings bank prepared, being co-operated with trampoline clubs in the Czech Republic, Children Days in 6 towns for all children, who wanted to try their skills and co-ordination on trampoline under skilled trainers supervision. Blue Pyramid Club Children Days took place in Brno, Dvůr Králové nad Labem, Litoměřice, Olomouc, Rožnov pod Radhoštěm and Turnov from 1st to 3rd June 2001. At Four Nation Competiton all team members practised 3 routines of 10-skills each – compulsory routine (judges value execution only), voluntary and final routines (judges value execution and difficulty too). The team result consist of 4 best marks of the team members in each round. The favourite was the Great Britain team, which belong to the world trampoline top teams. Great Britain were represented in the Olympic Games 2000 both in the women and in the men individual competition. The Great Britain team consisted of 6 young well-balanced competitors, both women and men. The Denmark team (only men) was also a strong rival. Recently, there was a quite power growth in the Denmark team. The hart of the Czech Republic team created Petr Dufek (TJ Petřiny Praha), Lenka Honzáková (SK GT Litoměřice) and Petra Vachníková (TJ Rožnov pod Radhoštěm). Lately, Petr Dejl (TJ Petřiny Praha) registered a power growth too. The Rhineland team, which always include some competitors belong to the Germany national team came to the Four Nation Trampoline Competition in Turnov reduced by the injury of its best competitor. In the compulsory routine's round (judges value execution of the skills only) practised teams from Great Britain (108,8 points), Czech Republic (108,5 pts) and Denmark (108,3 pts) well-balanced performance, teams were 5 pts ahead of Rhineland team (103,7 pts). The best compulsory routine had Peter Jensen from Denmark (28,2 pts), the second best one had Gary Smith form Great Britain and Petr Dufek from the Czech Republic (both 27,6 pts). The best woman compulsory routine had Petra Vachníková and Lenka Honzáková (27,2 pts and 27,1 pts), both the best Czech female competitors, after them Katehrine Driscoll from Great Briatin (26,6 pts). In the voluntary routines (judges value execution of the skills and their difficulty too) proved the Great Britain team, that was the real favourite of the competition. Thank to the very balanced performances of men team members the British team fastened its leading position (261,0 pts) after qualifying round (= compulsory + voluntary routines). There was the narrow match between the Czech Republic team and the Denmark one. The Denmark team consisted of 6 men. Men generally practise routines with higher difficulty and so they obtain usually higher marks. Despite of this fact the Czech team increased its mark advantage ahead of the Denmark team by 0,7 pts to the mark of 254,2 pts for qualifying round. The Denmark team got 253,3 pts. The best voluntary routines had again Peter Jensen (40,2 pts) and Gary Smith (39,5 pts), Petr Dufek was the 5th (38,5 pts). Among ladies Lenka Honzáková (35,7 pts) and Petra Vachníková (35,4 pts) were before Katherine Driscoll and Julie Calefice (Rhineland), who obtained 35,3 pts. In the final, Gary Smith performed the routine with the highest difficulty of the competition (15,6 pts). His competition performance was the most important contribution to the victory of the Great Britain team (413,9 pts), which came through the competition without greater fault. (the British team : men - Gary Smith, Andrew Coulter, Gary Short, women - Katherine Driscoll, Polly Osmond, Aurora Necco). Men from the Czech team did not have a good run. Petr Dufek did not finish his final routine and judges valued the faults in the Petr Dejl’s final routine by the higher deductions. In spite of the fact, that our women obtained for their final routines higher marks than in the qualifying round, the Czech team did not maintain the second place and finally the team got the bronze medal (402,3 pts). The second place reached the Denmark team, especially thank to Peter Jensen and Mads Sejeroe. They were obviously better competitors than the rest of the 6 team men members. As for individuals (each individual obtained the mark for compulsory, voluntary and final routines), the best was Peter Jensen (109,1 pts), the Danish number one. He is the Danish hope for the World Championships (23th-26th July 2001 in Odense, Denmark) and for the Olympic Games 2004. The second and the third position reached Gary Smith (107,5 pts) and Andrew Coulter (106,0 pts), both from Great Britain (individual results - in czech only). Petr Dufek had a chance to be around the 5th place, but he did not finish his final routine and so, the best from the Czech team were Lenka Honzáková on the 6th place (99,4 pts) and Petra Vachníková on the 7th place (98,4 pts). Lenka was the best female competitor of the competition.